I’m struggling a lot with these two true, inspiring, triumph of the human spirit distance runner stories that Disney and her sports arm (ESPN) have perpetrated upon us this week as paradoxical bookends to the low anthropology/high Christology that I have come to love about Ash Wednesday. This past weekend, ESPN master human interest storyteller, Tom Rinaldi, narrated one of his best sports mini-docs with the story of Kayla Montgomery, who won three North Carolina high school distance running state championships in 2014, despite running without being able to feel her legs! (Yeah, the story is as good as it sounds). And today, Disney’s “Mcfarland, USA” debuts (the true story about a South Texas high school cross-country team that overcomes numerous cultural and economic hardships en route to running glory). Reviewers are calling it “The Rookie” (also a Disney, South Texas based sports film) of cross-country. Rats, I’m in. Overcoming insurmountable odds and literally running for, and achieving, glory and championships – it really does warm our hearts on a cold February night, doesn’t it? In ESPN’s Kayla Montgomery segment, we see her literally collapse into her coach’s arms after winning each of her three state championships last year. Montgomery has Multiple Sclerosis, which as is explained, is a blessing and a curse for a teenage distance runner. The upside is that when she runs, she feels no pain in her legs, because she doesn’t feel “anything”, other than the assurance that comes from the sound of her feet bouncing firmly off the ground. The downside? – she can’t feel how fast she’s going, so pacing herself means only gauging herself in relationship to where the other runners are. She’s a remarkable girl, and it’s a tremendous story. If Disney doesn’t make a movie out of this, I may have to. The finish line scenes are hard to watch. MS inflicted athletes lose most feeling from head to toe when their bodies are overheated. When Kayla collapses at the end of a race, not only can she not walk, she’s feeling full body paralysis. Terrifying, and well depicted in the segment. One thing struck me though, as Kayla is shown falling into her coach’s arms (a hero himself by the way) after each of her three victories last year. We’re only seeing her collapse into her coach’s arms after she wins. Rinaldi tells us that Kayla lost a lot of races on the way to her stellar senior year. We weren’t presented with video of any of THOSE collapses into the coach’s arms in this mini-doc. It made me wonder about all of the disease afflicted athletes who leave it all on the field but don’t win. What about the afflicted runners who run for a prize and come up short?…..and worse still, come up short and have no arms to collapse into? When we watch stories like this, we’re at the mercy of what the editor, producer, and storyteller want us to see. Hats off to them. I watch this segment and I’m confident that probably not even the most cynical among us would scoff at it. It has MASS appeal. There is nothing that gives us pause. There’s no scandalon to stumble upon. It’s universally regarded as a human triumph. I am invited by the segment to love Kayla’s story, because it is crafted to tell me that if she can win three state championships in one year with no feeling in her legs, certainly I am fully equipped to be a champion in all of the endurance races in my life – as a father, parent, worker, Christ-follower, etc. Certainly, I will (one day) collapse gloriously into my heavenly coach’s arms. Sure, I’ll have my defeats along the way, but the videotape that counts will depict the triumph of my indelible human spirit. Further, now I can go this weekend to see “McFarland, USA” and be reminded (with more perfectly crafted running metaphors) how I can overcome all odds in this life and achieve my best life now. They might even mention God for good measure, after all, I can’t do this by myself right? Walt and Tom, I love you guys. I really do. You’re killing me though (and not in that good “dying to self” way). So, step off! 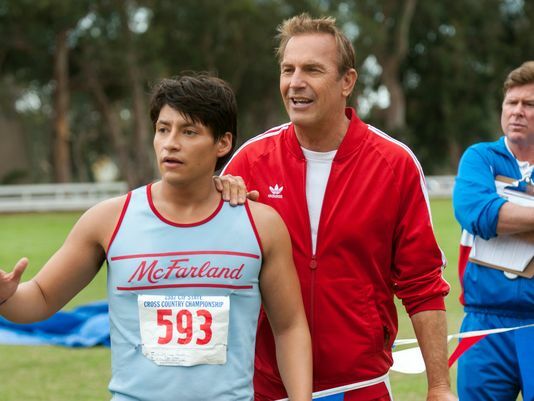 Kevin Costner is certainly going to bring a tear to my eye as he portrays the McFarland runners’ coach. Kayla’s coach may be the best depiction of a coach that I’ve ever seen. My track record kind of stinks though, and my senior year is a distant memory (and not all that glorious). Thankfully, however, I have some “true and better” arms to fall into when this race ends.